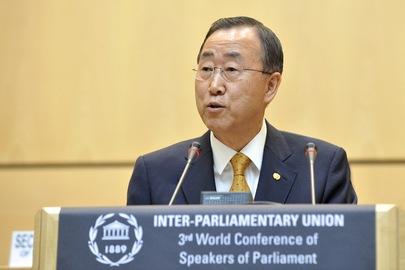 UNITED NATIONS, August 12 -- Two days after author Tom Plate repeatedly said that UN Secretary General Ban Ki-moon would be the subject of the third book in his “Giants of Asia” series, Ban's spokesman on Thursday told Inner City Press Ban has not made any commitment to Plate or anyone else. Video here, from Minute 15:33. Also during his opening presentation, Plate said that “Ban Ki-moon confirms that Singapore's candidate [for UN Secretary General in 2006] withdrew, opening the field even more” for Ban. While Plate is or was a journalist, strangely requests were made just before the book party that no Press be present. It was too late, invitations had been made. Inner City Press: yesterday, I’d asked you about this Giants of Asia series and the Secretary-General being the third subject of it. You said, “I’ll look into it.” Have you? And is he going to do it? And how much time will it take? And what’s the benefit to the UN organization? Spokesperson: What I can tell you is that the Secretary-General has made no commitment to Mr. [Tom] Plate, or indeed to anyone else, with regard to a book. Question: Mr. Plate said on Monday that he had, and I’ve talked to some other senior UN officials who have said he is the third one in the series, so I guess is there some… has there been some change? Spokesperson: Well, I can tell you that the Secretary-General has made no commitment to Mr. Plate or indeed to anyone else. Question: Okay, when was the last time he saw Mr. Plate? Spokesperson: What’s that got to do with it? Spokesperson: That’s got nothing to do with it, Matthew. I can tell you that the Secretary-General has made no commitment to Mr. Plate or indeed anyone else. Okay. When is a commitment a commitment? Watch this site. UN's Ban To Be 3rd "Giant of Asia" by Tom Plate, Lee Kuan Yew's Confidante on Sri Lankan "Ethnic Cleansing"
UNITED NATIONS, August 11 -- Starting with a 200 page book of “Conversations with Lee Kuan Yew,” the get-things-done founder of modern Singapore, American author Tom Plate is engaged in a Giants of Asia trilogy. The next in the series is Mahathir Mohamad of Malaysia. The third Giant of Asia, Plate said at a VIP book party on August 10, will be UN Secretary General Ban Ki-moon. Plate told an audience including the Permanent Representatives to the UN of Vietnam, Costa Rica, The Netherlands and of course Singapore, which hosted to event, that in his experience Asian leaders are more concerned about community rights than individual or human rights. He asked rhetorically, do you want to solve the problem of drug gangs in Los Angeles? 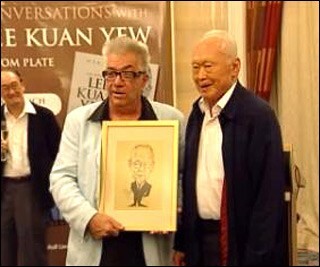 Give Lee Kuan Yew $10 billion, and look away for 18 months. Come back and it will be solved. Some in the audience wondered what might happen during those 18 months, from the leader who instituted caning for the mis disposal or even chewing of gum. A professor in the audience asked about the balance between development and human rights. Plate responded that while to the “Western” mind, publicly punishing the wrong person in order to send a message to others might violate due process, to Lee Kuan Yew and presumably the other Giants of Asia, the calculus is not so simple. If the mis-punishment helps the community at large, it might on balance be a good thing, Plate said. Inner City Press, invited without conditions to the event but then asked to not mention at least one of the attendees, asked Plate if he would consider interviewing some of the more openly authoritarian strong men of Asia, including Than Shwe of Myanmar and Kim Jong-Il of the Democratic People's Republic of Korea. Plate replied that if asked to go to Pyongyang and given access to Kim Jong-Il, he would be on the next plane. He said that he doubted Than Shwe, at 76, could endure the type of multi-day interview process which he engaged in with Lee Kuan Yew. One wonders, then, how a sitting Secretary General, embroiled in a management scandal triggered most recently by the damning End of Assignment Report of outgoing lead UN investigator Inga Britt Ahlenius, will have time to sit for this Giants of Asia profile. Without attributing the concerns, there seem to have been a belated request not to publicize the identity of Plate's third Giant of Asia until after Mr. Ban's second term is more secure. But, one skeptic in the audience asked, is the problem here really the publicity or the vanity book project itself? 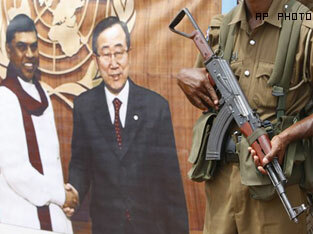 UN's Ban Depicted in Sri Lanka: Giant of Asia? Plate was asked about this section of the book, and said that it was difficult to keep it in. Afterward, Inner City Press asked Plate to explain: who had wanted the section to come out? Of all that he said Tuesday night, this was the only time that Plate asked to go off the record. We will respect that, just as we'll respect the request to omit the presence of at least one individual and entourage. Singapore's Mission to the UN, its Permanent Representative Vanu Gopala Menon, his Deputy, wife and staff are to be commended for hosting such an eclectic crowd, and serving afterward such good food, including the Indian paratha bread renamed roti -- and tinged with coconut -- when it arrived in Lee Kuan Yew's giant laboratory in one of the smallest nation states. There were Tamil advocates among the attendees, including the son of the plaintiff in a recent free speech case in the U.S. Supreme Court. Some wondered at the irony of Ban Ki-moon, who long delayed naming, and still has not begun, a panel about accountability for civilian deaths in Sri Lanka in 2009, choosing as his conversational biographer the writer who coaxed the above quoted analysis of ethnic cleansing and Sinhalese extremism in Sri Lanka, to the level of the president. We will have more on this and on the rest of Plate's illuminating talk, including his and Lee Kuan Yew's views of the UN and the ways in which its Secretary General are elected and, at times, re-elected. The interplay of Ban's drive for re-election and his participation as Plate's third “Giant of Asia” will also be explored.